It is finally here! The air is crisp, the sweaters and boots are out, and the pumpkin spice is everywhere! Can you see my excitement? We are slowly but surely getting settled into our lives as official East Coasters and we are excited to explore all that this side of the country has to offer. One experience that we are really looking forward to is seeing the changing colors of fall. Back in California, we didn’t really have seasons, so this will be a welcome, although chilly change for our family! We’ve visited the East Coast several times during the fall and even lived here through one beautiful fall, but there is seriously so much more to explore and we’ve barely even scratched the surface. After moving to the East Coast after living in California, I’ve really had to revamp my wardrobe for fall. If you’re coming to the East Coast this Fall, be sure your suitcase is full of some great layers! The mornings and evenings here can be below freezing, but the afternoons can be so pleasant that you’ll only want a long sleeve shirt. The great thing about layers is that it can give you really versatile looks without overpacking. 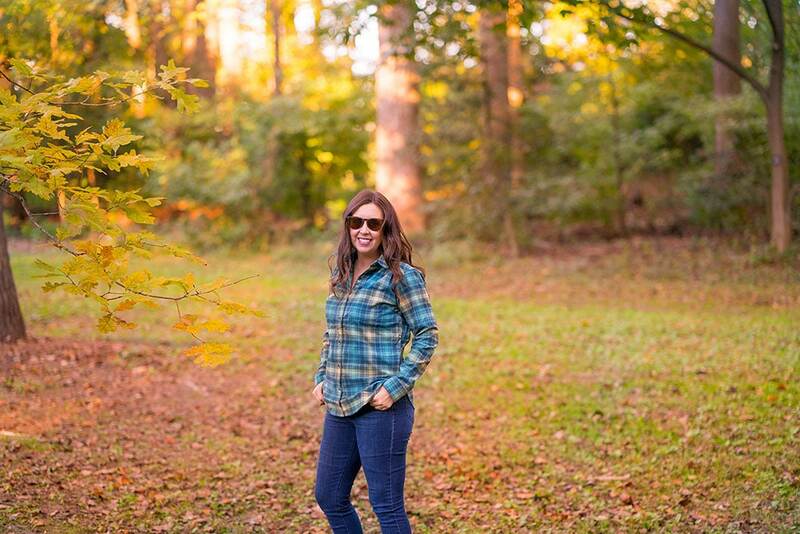 I love this gorgeous Royal Robbins Merinolux™ Flannel Long Sleeve shirt from Zappos as a great base layer or stand-alone statement piece. It’s warm enough to wear alone with jeans and boots, but can be layered and dressed up for a more fashionable fall look. Royal Robbins combines the eco-friendly fabric technologies of Merinolux wool blended with Sorona® that makes their clothing super soft, naturally odor-resistant and quick drying. All great things when you’re out enjoying nature. Royal Robbins also makes pants from recycled PET bottles. It doesn’t get much more eco-friendly than that! I love shopping for my Royal Robbins clothing at Zappos because of their super fast shipping, great return policy, rewards program, and video product reviews. 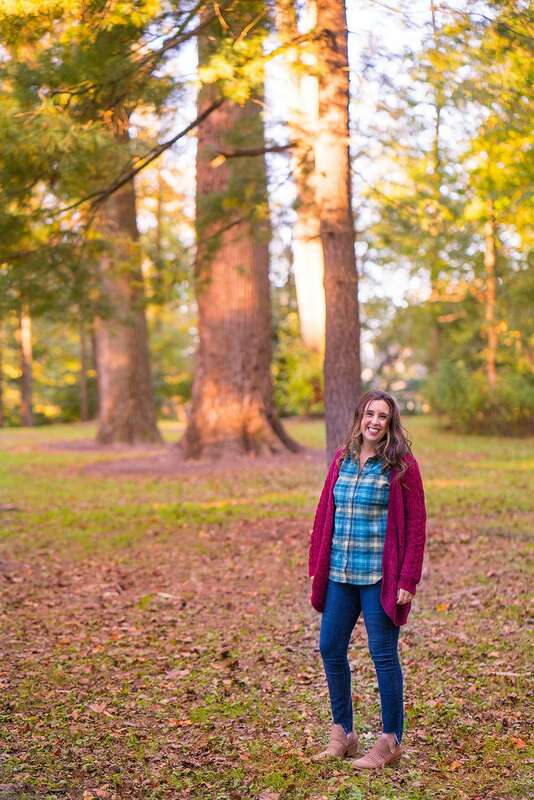 This Royal Robbins Merinolux™ Flannel Long Sleeve shirt from Zappos comes in two different colors and would be great for a tough fall hike through the colorful woods, or for a night out! I love the hidden zip pocket at the hip that is great for storing money and credit cards while traveling. 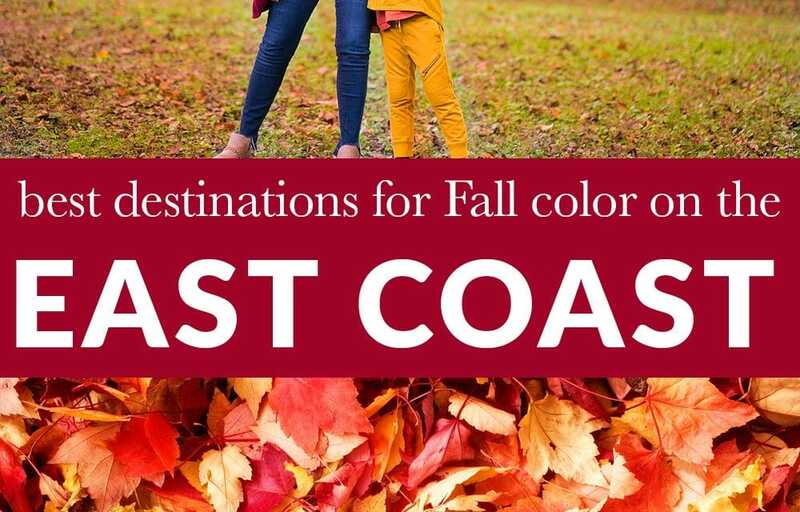 With so many amazing Fall destinations on the East Coast, it’s hard to narrow down where to begin. Just walking out my front door is an explosion of color in Northern Virginia! Here are my personal favorites in the area. Soaking up the glorious East Coast Fall! I’m lucky enough to be able to walk out my front door and be greeted with some of the most beautiful fall colors in the country. 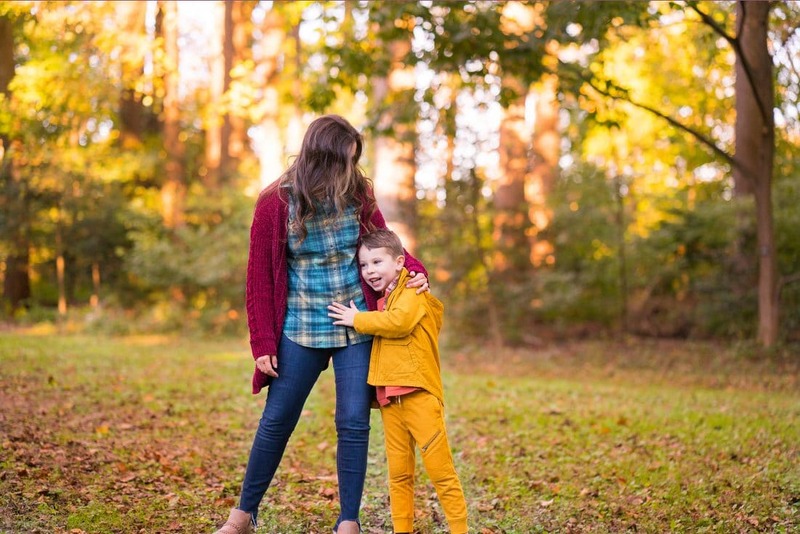 Northern Virginia is an explosion of red, orange, yellow, green, and brown during the fall and with many U-pick orchards around, its a festive fall around here for sure. Just a stone’s throw from my home in Northern Virginia is our beautiful Nation’s Capital. I may be a little biased, but I think Washington DC is one of the most beautiful cities on the planet. 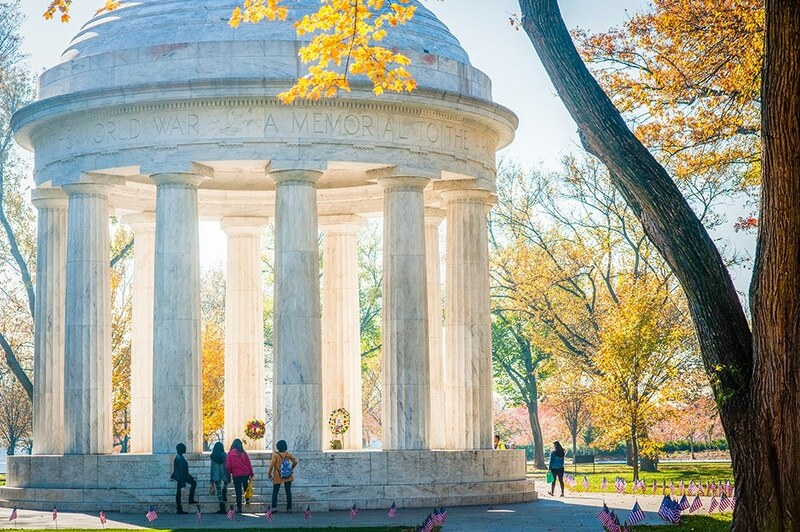 With its large, open, and planned out tree-lined streets, it is even prettier in the fall when you can see the monuments surrounded by an explosion of colors. 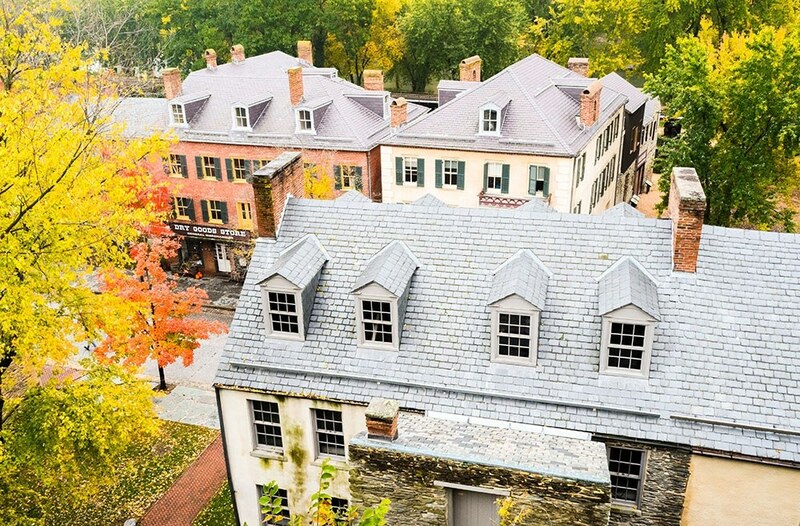 My parents lived in Harpers Ferry for 10 years while I was in college and newly married and starting a family. We would come home for the holidays and it was always such a magical experience to see this historical town bursting with color. Harpers Ferry sits on the confluence of the Shenandoah and Potomac Rivers giving you stunning views in any direction. If you visit the city at the right time you can see Civil War reenactments while wandering high street and imagine life in the 19th century. Known as the capital of Halloween, this town full of history is a great place to visit during the fall, not only for its magnificent foliage but also for the fun Halloween activities and spooky atmosphere. 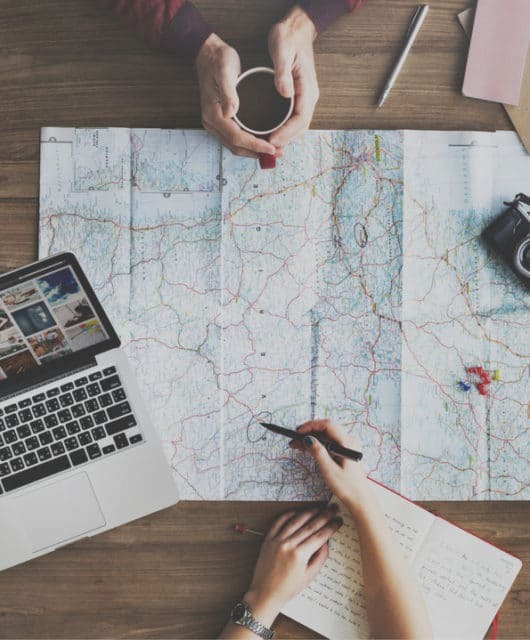 Since there is still so much of the East coast that we haven’t explored, I’ve asked some of my local East Coast friends to recommend their favorite Fall destinations in the area. Some of them are familiar, and some are totally new to me. The Adirondack Mountains in Upstate New York is famous for its endless forests and stunning scenery. While almost anywhere in the Adirondacks is incredible for appreciating the magnificent fall colors, there is one place that was built just for that experience. 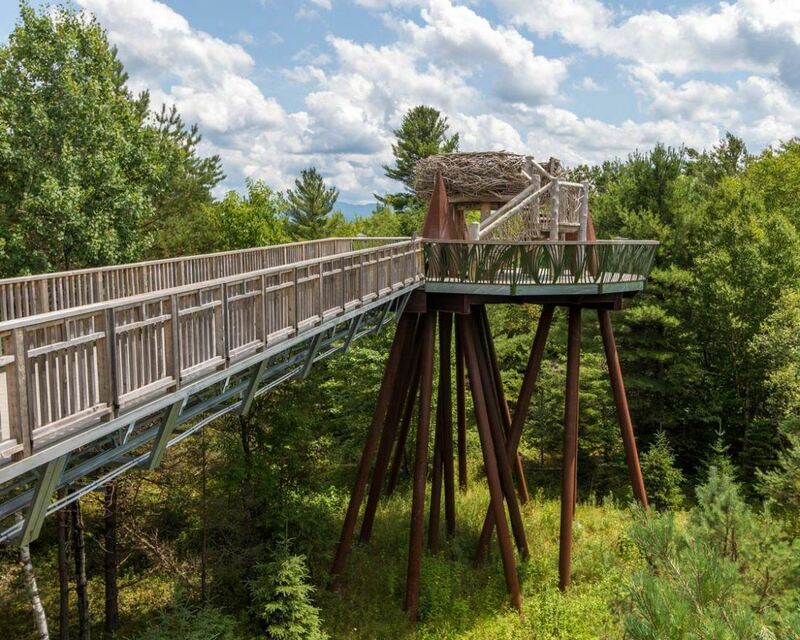 The Wild Center Adirondack Adventure Center in Tupper Lake NY is an interactive museum and nature experience with one of the most mind-blowing treetop experiences in the world. And there is no better place to watch the autumn colors explode than from their 30-foot eagles’ nest overlooking the tree covered Adirondack mountains. Tupper Lake is just a short drive from Upstate New York attractions like Lake Placid and Ausable Chasm, so it’s easy to pack The Wild Center and other great Adirondack activities into a weekend escape. And The Wild Center ticket is good for two days, so you can spend one day watching the colors from the Wild Walk treetop adventure, and the next day canoeing along the Oxbow bend of the nearby river. Read more about the Wild Center here. Looking for beautiful fall colors? You need to head over to Virginia’s Shenandoah National Park! Shenandoah is the East Coast’s playground. It is only 50 miles from Washington D.C., and an easy weekend trip from New York and Philadelphia. 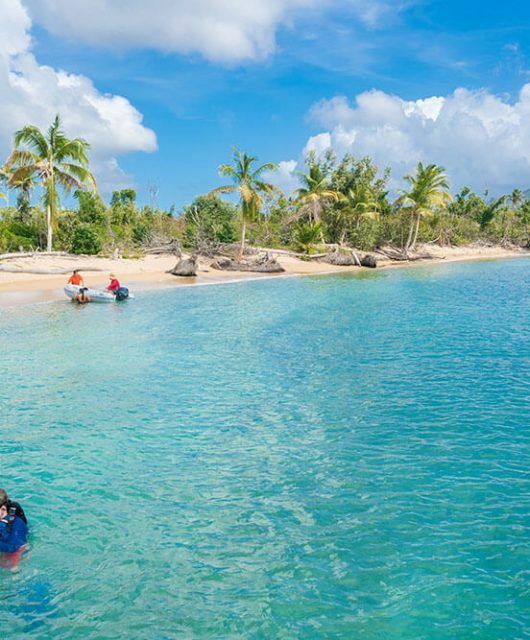 With over 200,000 acres of protected wilderness, it’s the perfect escape for families, couples and solo travelers. 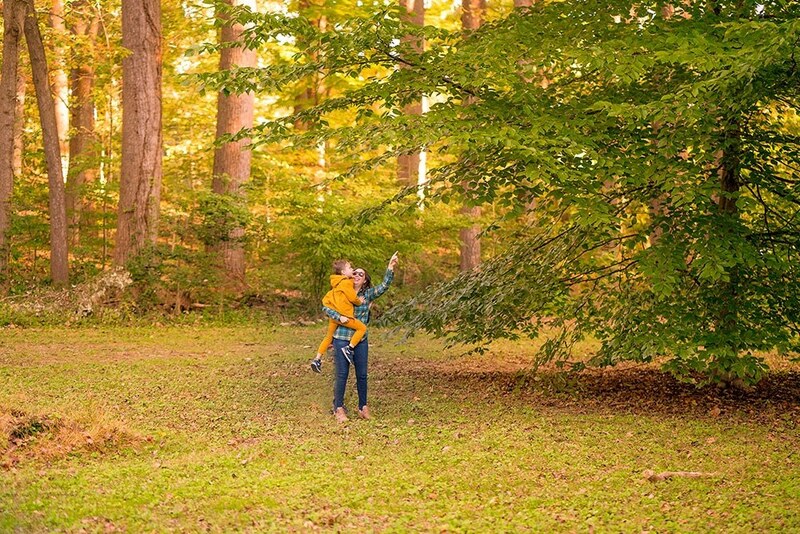 While Shenandoah is beautiful year-round, it’s most famous for the bright hues of orange, red, and yellow during peak leaf-changing season in the Fall. In October and November, the mountain slopes are transformed from their normal green to every shade of autumn foliage. The air is crisp and the normal Virginia humidity levels are low. Hikers can enjoy the fall colors from any of the park’s 500+ miles of trails. Others can cruise along the famous Skyline Drive, which travels along the ridgeline of the Blue Ridge Mountains and take in the park’s beauty from the comfort of their car. Either way, Shenandoah is the perfect place to enjoy the leaf-changing season. 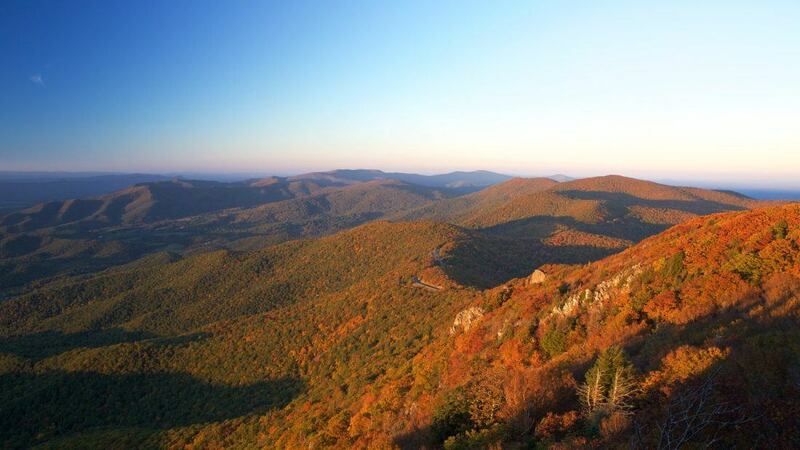 If you’re looking for a Fall vacation, be sure to check out Shenandoah National Park and learn more here. Fall in New York is relatively mild, temperatures are comfortable to explore the city. October and November are good months to see fall colors in New York City and the best place to go leaf peeping is Central Park. Central Park is the most visited urban park in the United States, with almost 40 million visitors a year and one of the most filmed locations in the world. A wooded area with mature oak, cypress, and beech trees, ponds, and pictures bridges… all surrounded by the tall building of NYC! We were lucky to have been there during fall one year. It was sunny and pretty day.. with the leaves changing colors and New Yorkers enjoying their weekend. You can rent bikes and explore the park at your own pace. 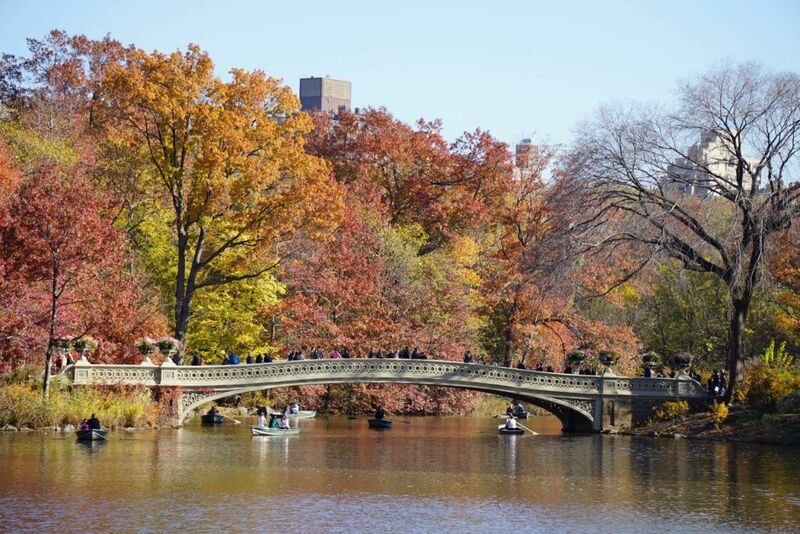 Don’t miss attractions like Belvedere Castle, Strawberry Fields, Alice in Wonderland, Bethesda Fountain and the many bridges around the park. Named for the Italian meaning ‘beautiful view,’ Belvedere Castle offers park goers panoramic views that include some of Central Park’s most beautiful landmarks. One of Central Park’s most cherished sculptures is a depiction in bronze of Alice and her friends, the characters from Lewis Carroll’s Alice in Wonderland. Paddle boats and canoes are available for rent as well. 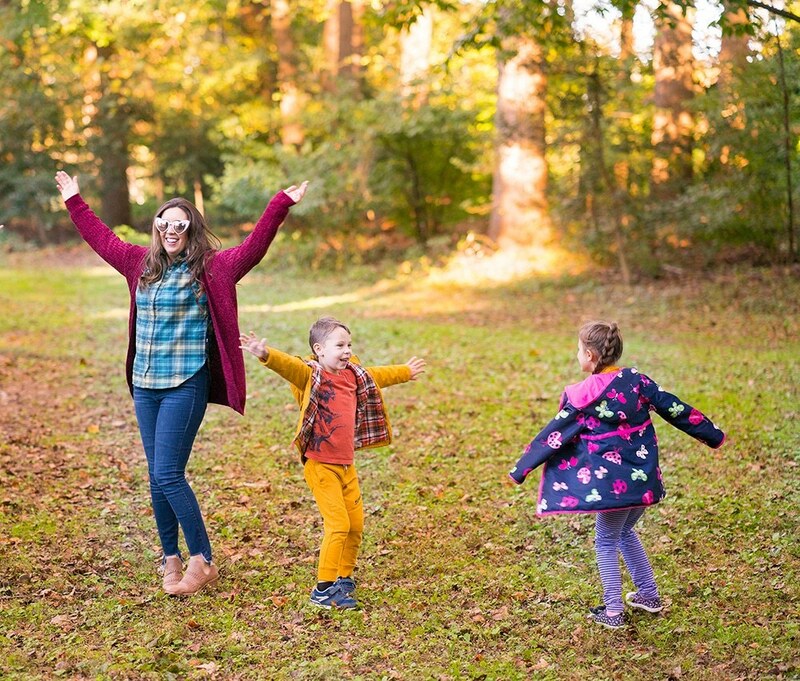 Pack a picnic and enjoy the outdoors while the kids enjoying playing in the playgrounds. There are about 20 different playgrounds inside Central Park. Learn more about Fall in NYC here. The Hudson Valley and Catskill areas of New York are a short drive from New York City but the beautiful fall foliage colors will make you feel far from city life. There are lovely hikes throughout the Catskills that you can take and see the fall colors. There are also many farms to visit. 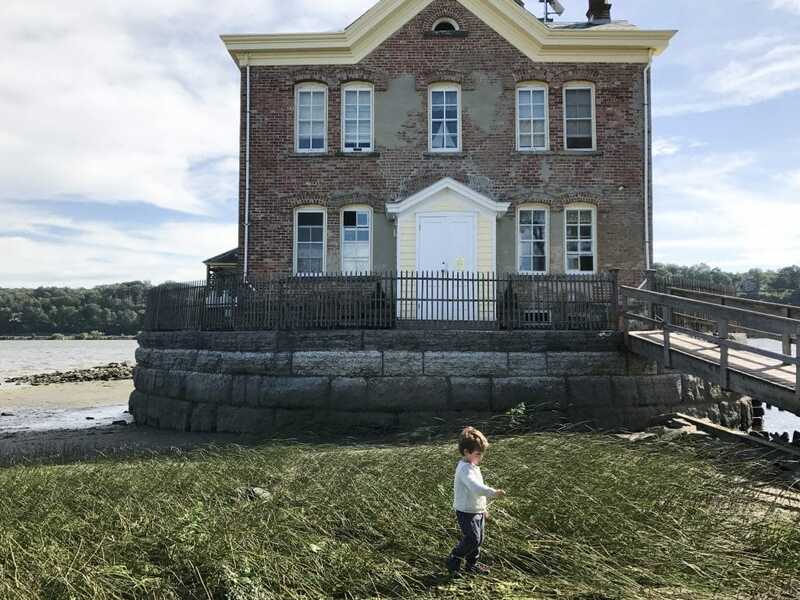 One spot we love in the fall is the Saugerties Lighthouse because you are on the beautiful Hudson River while seeing the fall colors. Learn more about fall in the Hudson Valley here. 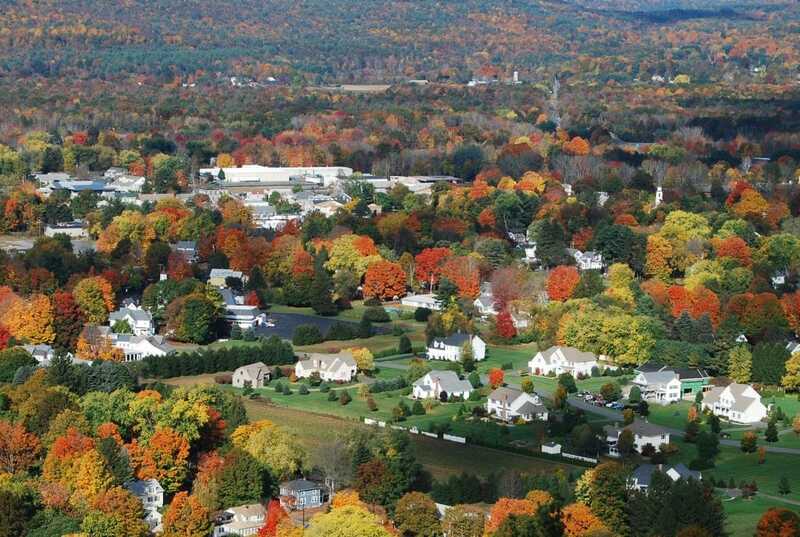 There are many places for amazing fall color, but our favorite is the Amherst, Massachusetts area. 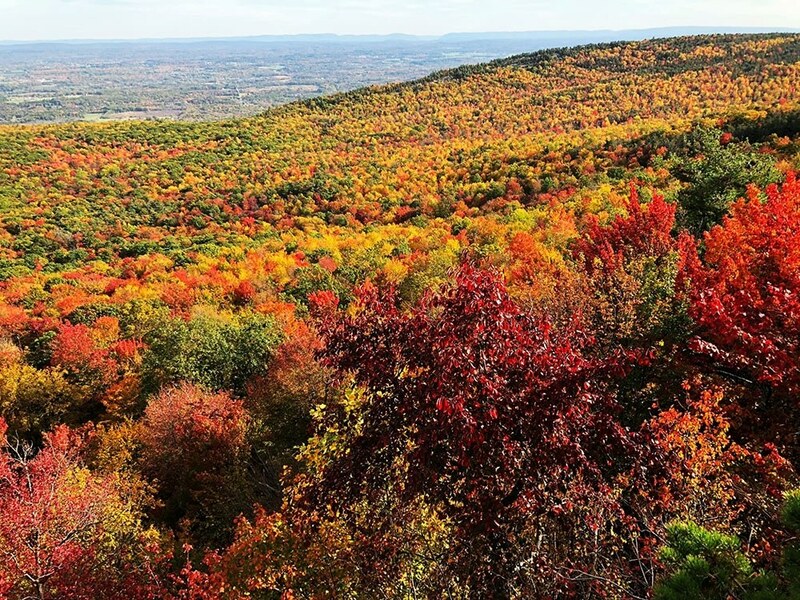 The top of the Mount Sugarloaf in nearby South Deerfield offers a stunning view of fall foliage against the backdrop of the quaint New England town. It is possible to hike to the summit of Mount Sugarloaf, but we’ve always driven. 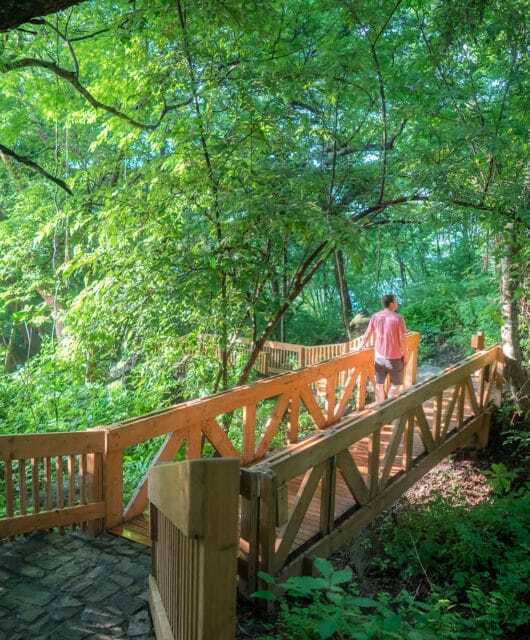 There is no shortage of hiking trails in the area, and our favorite was Rattlesnake Gutter, which features a flat, clear path and beautiful wooded scenery. The timing of peak color is hard to predict, but if the stars align with your trip, you’ll be in for a real treat. 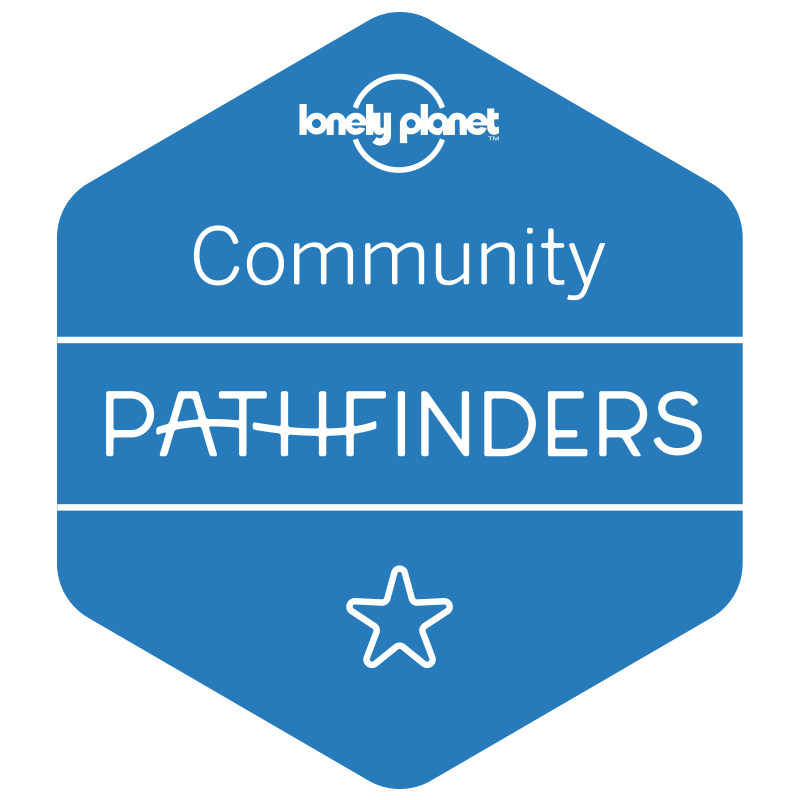 Learn more about Amherst here. Fairfield County is the southernmost area in Connecticut closest to New York. 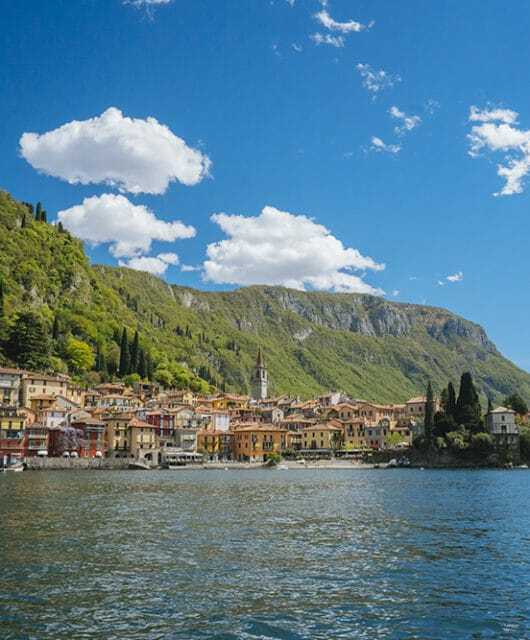 The area is very popular with NYC commuters and has a small town feel. Fall foliage can be seen everywhere in Connecticut. From driving through I-95 to smaller backroads, the orange-yellow colors have been blossoming for some time now. For the best foliage, I recommend driving through smaller towns away from the coastal areas, as those roads are densely covered in trees and make for a scenic drive. 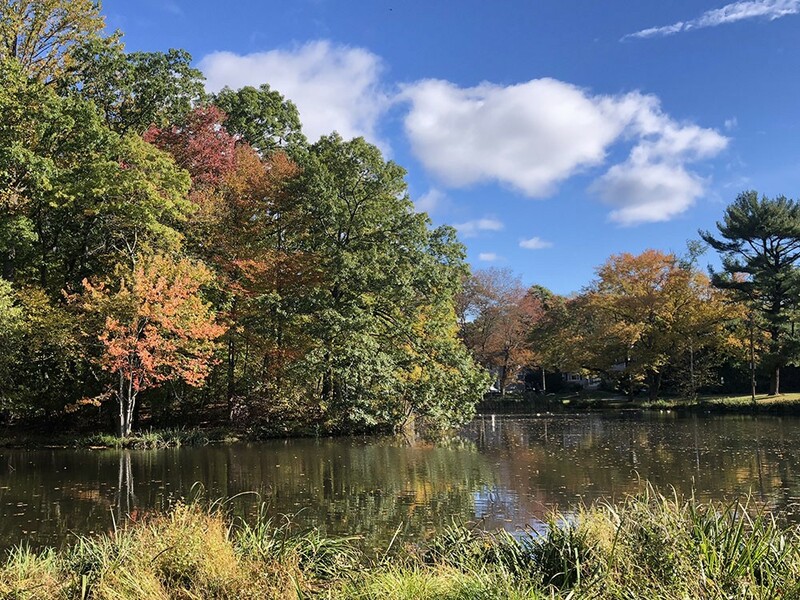 Learn more about Fall in Connecticut here. Our friends have been visiting Maine in the fall for some time now, so when the opportunity came up to go, we jumped at the chance. Bar Harbor is a unique and amazing town to visit and fall is the best time to go! The crisp air felt great coming from 90+ degree weather in Florida. The colors of the tree’s in Acadia Park are just breathtaking. I could spend days in this park just to view the colors. With the water and islands in the background, there were some very opportune times for some great photography. 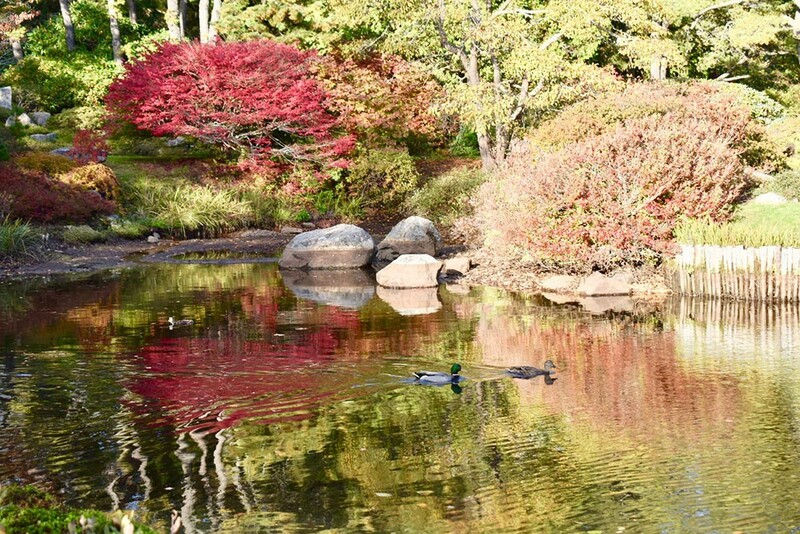 We visited a Japanese garden, yes I know, in Maine? It was just stunning and peaceful. The fall colors here were really vibrant and planned out perfectly. My favorite season and now one of my favorite places to visit! Learn more about Bar Harbor here. 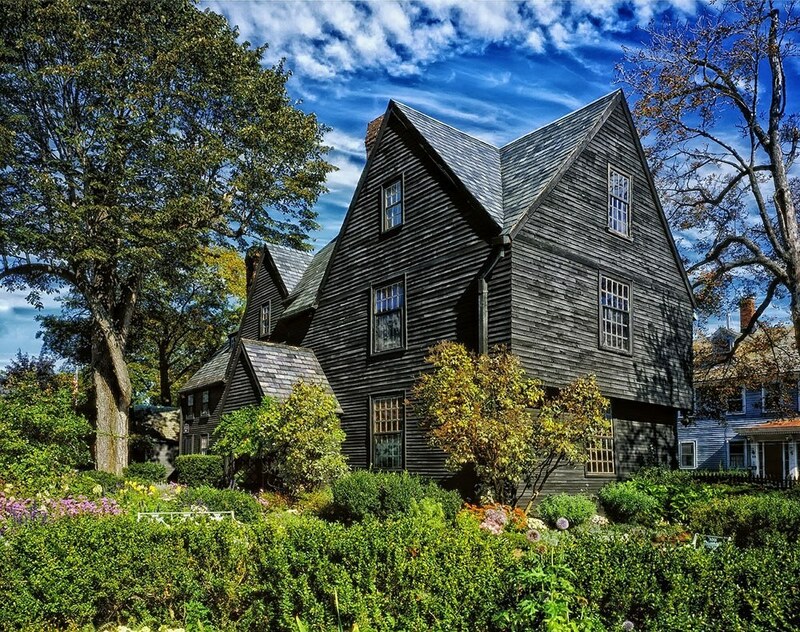 New England is possibly the most popular place for fall foliage in the USA, with people from all over the country flying in to Logan Airport to then drive around the region’s highways in search of the most instagramable views. But I think the first stop out of the airport should be in Boston itself because this city knows how to do fall like no other. First of all, Boston is walkable. 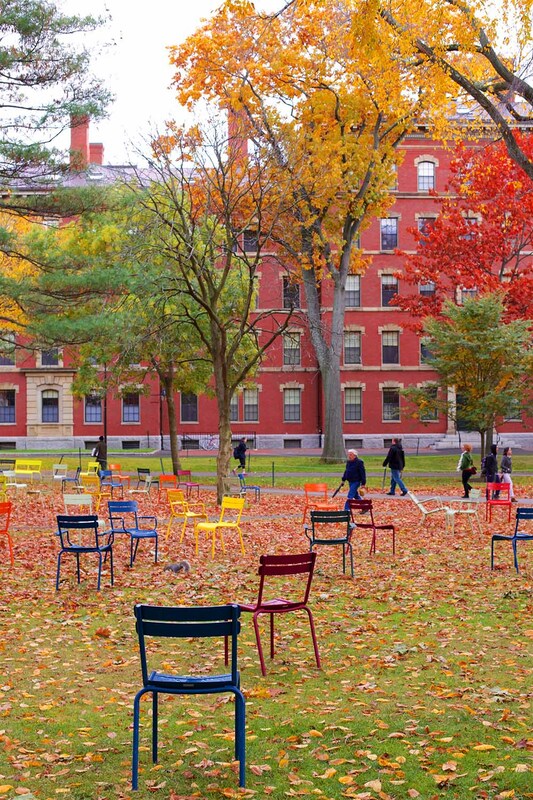 While many American cities require one to always use a car, Boston with its cobblestone streets and historic neighborhoods is perfect for a walk on the carpet of yellow and red leaves. Make sure to explore Beacon Hill with its gorgeous (and super-expensive) houses, as well as the North End (Little Italy of Boston) where you can stop for a pizza or pasta at one of the many Italian restaurants. Second, Boston has beautiful Boston Common and Public Garden that are amazing in any season, but during fall months it’s just the next level kind of beauty. Another great idea is to walk on the esplanade by Charles River. And if you find yourself in Cambridge, just across the bridge from Boston, stop by the Mount Auburn Cemetery. It may sound creepy to some, but I always try to visit famous cemeteries in the cities I visit, and Mount Auburn Cemetery is absolutely beautiful in fall. Learn more about Boston here. Minnewaska State Park is one of the best places in the Hudson Valley in the fall to see fall color. It is a spectacular blaze of red, orange and yellow. The focus point of the park is a lake that has an easy hiking trail circumnavigating it. About halfway around, a short trail off to the right leads to a lookout with spectacular views over the surrounding Shawgunks. An autumnal forest spreads as far as the eye can see. Back on the lake trail, cliffs give equally beautiful views of the lake and the trees surrounding it, dotted with bright reds and oranges. The whole hike takes about an hour, so this an easy place to see great fall color. The park is about two hours north of New York City. 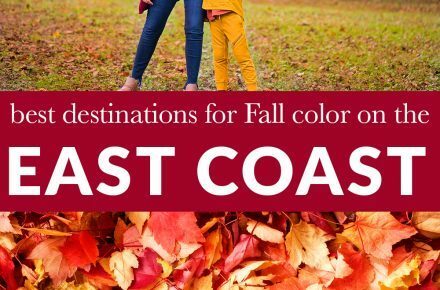 This list still barely scratches the surface of all there is to see on the East Coast in the Fall. I can’t wait to start exploring this season. 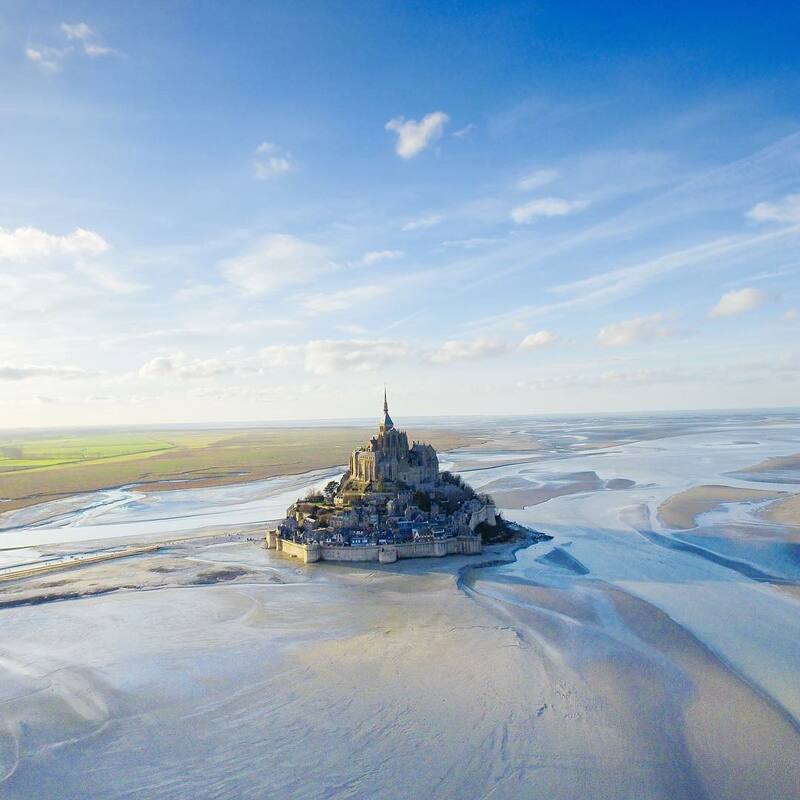 Where is your favorite East Coast Fall destination? Be sure to check out Royal Robbins at Zappos to fulfill your Fall packing list needs!